Who are the “Price Fighters”? Home News Archive Who are the “Price Fighters”? One of the recurring themes on this site has been to discuss the apparent love/hate relationship between the Pentagon and its defense industrial base—the contractors who enable the warfighters to, you know, fight. We’ve written about it too many times to easily count. (But you can do a keyword search for all those articles, if you’re so inclined.) It’s become clear that the relationship that existed in the mid-90’s—that of “trusted business partner”—is no longer the case. Instead, it’s become adversarial. We assert that this is no longer a matter of opinion; it’s now a matter of documented fact. When former Secretary of Defense called for reductions in non-valued-added Pentagon bureaucracy, those self-same bureaucrats almost immediately redefined the mission into a drive for reductions in contractor prices. Several of them did pretty well for themselves, parlaying their pieces of the redefined mission into cushy, well-funded, promotions. We documented that phenomenon as well. The thing of it is, we can’t flatly say it’s wrong to attack the contractors in a drive for efficiency and affordability—a Defense Department “that works better and costs less”. (How many of you get that reference?) The “jointness” of integrated operations now includes the contractors. They’re ineluctably intertwined and can’t be separated. So if you want to address Pentagon bloat and bureaucracy, you also need to address how that bloat and bureaucracy is outsourced to the support contractors. But it’s plainly wrong to focus on reducing contractors’ costs in a vacuum, as DOD has largely done to date. The attack on contractors is one of the clearest symptoms of the disease that has infected the Pentagon over the last decade or so. We don’t pretend to have all the answers, but we think one aspect of the overarching disease is a myopic focus on the “sharp end”—the tactical warfighter—and a concomitant lack of focus on the rest of the spear—which includes logistics, maintenance and support, as well as the contractors who enable the vast military machine to move toward its objectives. Whereas yesterday’s military travelled on its stomach, today’s military travels on the backs of its contractors. Pentagon leadership has failed to adapt to this new reality and, as a result, are attacking the very infrastructure that gets them where they need to go. Part of the attack on defense contractors has been the creation of “should-cost” pricing. We’ve written about it before. It’s a theory, created by those self-same Pentagon bureaucrats, that is predicated on the notion that the bureaucrats should tell the contractor what its costs will be, as opposed to having the contractor tell them. Implementation of that theory on price negotiations for the next buy of F-35 aircraft led to some interesting results: (1) there was an inordinate delay in reaching an acceptable negotiated price, (2) the parties polarized and relationships soured, and (3) the contractor’s overhead costs went up, driven by the costs of providing the government negotiators with thousands of pages of information, so that the negotiators could establish their “should-cost” targets. It was an unmitigated disaster. But that didn’t keep the Pentagon bureaucrats from trumpeting their victory over the contractor, in terms of negotiated savings achieved by their strong-arm tactics. Recognizing that full implementation of the new aggressive negotiating postures required access to many types of information, DCMA and the DOD Director of Pricing (Mr. Shay Assad) issued a memo late last year calling for better integration of DOD Buying Commands and military service personnel with DCMA Contracting Officers and DCAA auditors in the evaluations of contractors’ proposals to establish “forward pricing rates” (FPRs). FPRs are used by contractors in their cost proposals when they tell DOD how much they think their programs are going to cost. Yes, those are the same proposals that DOD is working hard to ignore as part of its “should-cost” initiative. So apparently, DOD not only wants to be in a position to ignore a contractor’s cost proposal, it also wants to be in a position to ignore its proposal to establish an agreement as to the indirect rates to be used in those proposals. This approach must make sense to somebody. It doesn’t make any sense to us. In our view, it’s just another symptom of a bureaucracy looking elsewhere—anywhere—rather than to look in a mirror and tackle its own issues. And it’s crystal clear what those issues are, as the Government Accountability Office told the Pentagon Leadership more than a year ago. Now, let us come to yet another symptom of the adversarial relationship between the Pentagon and its contractors. They are called “Price Fighters”. This is real. Apparently, the intent is to link these “Price Fighters” to the real warfighters who risk their lives every day to accomplish the nation’s national security objectives. We ain’t those guys, so we’re not particularly offended by the name. But let’s not fool ourselves: there ain’t nothing “risky” about looking at cost or pricing data, and negotiating contract prices. Where did we hear this term? We heard it right from the same Pentagon bureaucrats who have been championing the “should-cost” initiative. We heard it right from the same Pentagon bureaucrats who have been pushing the integrated forward pricing rate review teams. We heard it right here. The language of the memo is filled with noble phrases. Phrases such as “surge support,” “right place, right time,” and “on-time delivery of quality pricing products.” That’s all very nice, we’re sure. Just like the theory behind “should-cost” was also very nice. If the “warfighters” are fighting a war, what are the “Price Fighters” fighting? Yeah, you know where we’re going with this. This is yet one more symptom of the same disease with which the Pentagon is currently afflicted: the idea that the contractors are the enemy—the idea that there’s a war going on and it’s DOD against its own industrial base. But who are these “Price Fighters”? We think it may also be contractors. Yes, we have reason to suspect that the Pentagon has hired contractors to assist in attacking other contractors. That’s the problem with attacking contractors. They’re so baked-into the mechanism of how things are done, you can’t distinguish them from the DOD civilian workforce. You can’t tell ‘em apart. And since nothing can get done without the contractors to do it, you need to hire contractors in order to attack the contractors, because you don’t have the internal resources to attack the problem any other way. And thus some contractors are making a profit helping their Pentagon masters attack the profits of other contractors. In prison, those folks are called “trusties”—they are the convicts who are regarded as being worthy of a certain amount of trust, and thus they receive special privileges in return for acting as agents of the prison guard force. In World War Two, those folks were called “collaborators,” or “quislings”—and while they benefited from their support of the fascist occupiers, they later paid a price after liberation. Now, we’re not saying that contractors who collaborate provide support to the Pentagon in its efforts to drive down contractor prices should have their heads shaven, or be blindfolded and shot at dawn. No. Don’t think for a moment that we’re advocating any type of retaliation. 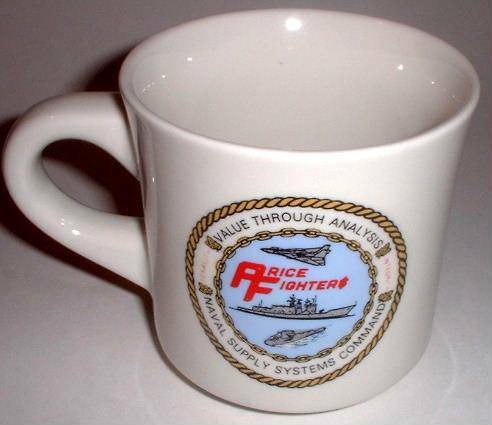 But do think for a moment about the people in power at the Pentagon, who apparently are so taken with their war on their own contractors that they have named a group of cost analysts “Price Fighters”. Are they really in a war? Is that really how they see it? Based on what we’ve seen over the past few years, the answer can only be “yes”.